Blogging is not just about writing. It is an art that people love to expertise. To start a blog, you must have a niche to follow. If you are expertise on a niche, then there is absolutely nothing better than the idea to start a blog with this niche. However, if you are a bit confused what to start with and what not to, here are some ideas you may like. 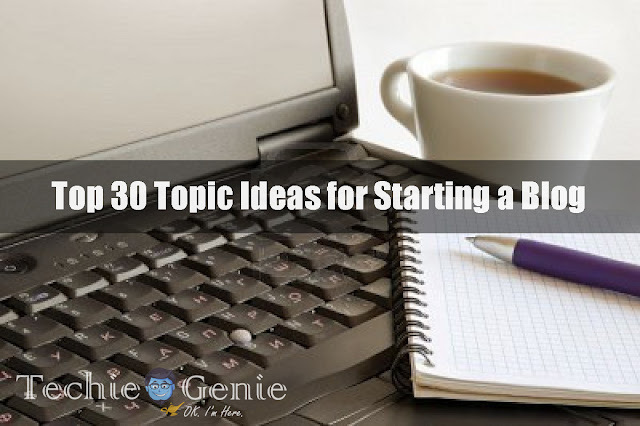 Have a look at the Top 30+ Topic Ideas for Starting a Blog! If you are willing to start a dedicated blog that will motivate people, it is a great idea to start with. Choosing a health and fitness blog attracts a lot of enthusiast. You might get a lot of traffic in this. A lot of people do search for language learning and translating options. Starting a blog on such niche can be beneficial. If you are willing to share your knowledge and information on hotels bookings, car rentals of different places, it is a great option. A lot of people do seek for proper ways to write. If you are good at it, you can share tips through blogs which will help the people. If you love pets and dogs and willing to share more about them, it is a great idea to go for. There are not man logs on such topics. It can be another idea to start up a motivational blog. Ambition and motivation blogs can really run good. Communication skills can be very important for a person. You can direct your blog to Interview communications, or B2B communication skills. There are many uncommon field of expertise which can help people to become entrepreneurs. You can also help them with your blog. If you are a fitness geek and have pursued training in different forms of MMA or Karate, it is a good option. A cooking tip is searched everywhere on the internet. Making a blog out of it can earn you money always. There are many men who seek for communication skills with women. A blogging topic on such might be very helpful for your needs. Technology has promoted many businesses to stand tall. If you wish to share these informations, there many business entrepreneurs looking out for you! Food blogging is definitely a primary choice you can make. From reviews to cooking recipes, all can be listed. Cyber bullying is a big crime, but many people are unaware of it. You might help them out if you have some knowledge. Many parents are depressed because of behaviour disorders in children. You can share your knowledge while helping them out. If you are a gym freak, body training, uses of steroids and workout tips can be the perfect way to start your blog. Many youngsters are looking to establish their own startups. If you have knowledge on this, you may share a lot of helpful informations. Golf is a passionate sport loved by many. But a few of them know the rules. There are a lot of people who are seeking for it. This can be very interesting thing to start with. A lot of school children are searching for such project ideas and tips everyday on the internet. Marriage and relationships are the most important things in this world. You can share tips of a successful marriage and share them on the blog. If friendship is a niche, then this is one of the best ideas that you can have! Obviously, such a blog would be in everyone's minds. Being a Triathlon is what every athletes look for. You can share your own tips or put information if you are an expert. There are a lot of people who are searching for what to choose their career options. Such a beautiful post will blow everyone's minds. This would be a great idea to start with. A lot of people might be searching over the internet for this. This idea is completely dedicated for people who are working on IT field. Such an idea can be impressive. The different types, the different recipes and the fun thing can always be shared here. It is a great option to choose. There are many stories of persons who live like this. You can place their stories over here. It can be another motivational and inspirational blog. You could help the ones who are depressed.